◼ 47 POP STARS SPENT ONE SUNDAY IN LONDON recording the song that became, for 13 years, the biggest selling UK single of all time. Do They Know It’s Christmas? 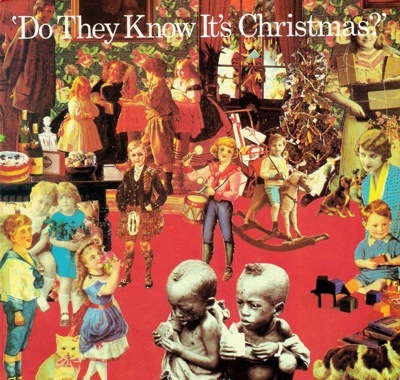 was released four days later on Nov 29, 1984, stayed at No 1 for five weeks, sold over three million copies and raised significant funds for famine relief in Africa. The project lead naturally the next year to Live Aid, the biggest global rock concert ever, viewed by two billion people in 60 countries, who coughed up still more dollars. It is estimated that Live Aid raised £150m (about $283m). 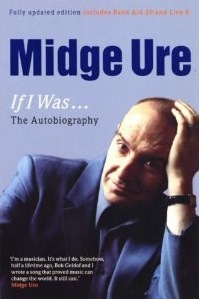 The idea for Band Aid was proposed by one man, Bob Geldof, since granted an honorary knighthood but in 1984 a musician down on his luck, who enlisted the much more successful go-getter, Ultravox’s Midge Ure (who remains unknighted for no good reason), to bring the dream to fruition as its producer. What I didn’t realise was that it was Bob’s confidence that was way down, not mine. When [his band] the Boomtown Rats were in their heyday he’d have written the song himself and harassed all his friends for money. 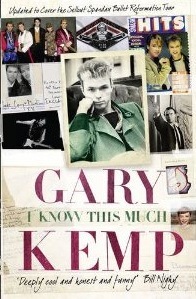 But in 1984 the guys having the hits were Sting, Duran Duran, Paul Young, Spandau … and me. Not Bob. His career was in the sewers and the Rats were broke. It’s impossible to imagine now, but he was too embarrassed to call up Sting and ask him to help. Sting, being Sting, would have said Yes without a moment’s hesitation, but at that time Bob didn’t believe in himself enough to even pick up the phone. Simon was a bit taken aback as Duran were due to play some dates in Europe, but quickly agreed they would be back for the recording. That night Bob bumped into Martin Kemp at a party. The word was out and soon people were calling Geldof. We had artists but what we didn’t have was anything close to a song. 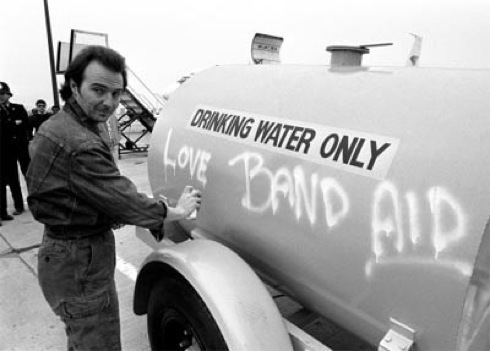 Flying out of Japan, there was only one thing we spoke about and it wasn’t being part of Bob’s Band Aid. We were to meet our opposition and spend an evening together with them. Tommy’s Pop Show was a biannual event and huge in Germany; if you got it, you did it, and this November it was to be Spandau Ballet and Duran Duran. 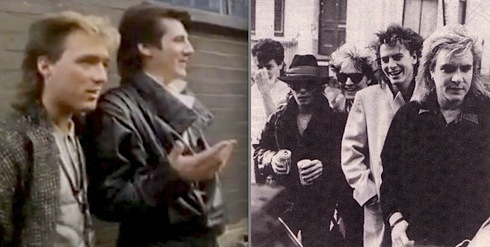 Given our great media-driven rivalry and similar origins it was extraordinary that we hadn’t met each other since the night [in 1980] we’d played Birmingham’s Botanical Gardens and, on the floor of the promoter’s flat, dismissed them. Now, putting music and chart successes aside, what we were all keen to prove was who could party the hardest. But our respective managements, seeing our horns appearing, were worried about the early start in the morning as both bands had to get back to London to record Geldof’s charity single, and so after the show we were all grounded in the hotel bar. Nevertheless, there were things that could still be done there. I guess the point of this post-show head to head was to stay up and stay standing. Unfortunately John Keeble, our star player, went bonkers on Jack Daniel’s and was stretchered off in the first five minutes. “The boy was overenthusiastic,” someone said respectfully, as one of our minders pulled him from the wreckage and away to his room. We could only watch gobsmacked: with no substitutes allowed on, we were already one man down and the Twiglets hadn’t even arrived. We were sort of pairing up now, sparring, like for like, pound for pound, mano-a-mano: I was enjoying some wry, arthouse natter with Nick; Tony and Simon discussed humidifiers; Steve and Andy talked at each other excitedly about music; while the two bass players — the so-called best looking bass players of all time — sucked in their cheeks and sized each other up for the long haul. People were sent off to find her number and phone her, but she was out. That something was the Metropolitan Police and the security services of Heathrow Airport. The next morning, while they waited at Heathrow, both bands boarded two private jets in Munich that would take them to make a record for a country of starving people. Even airborne, it was important to win. Our arrival at Heathrow left us all a tad embarrassed. There, primed on the tarmac, were the Met, the airport security and the limos, but not only was there no make up artist to greet us, there were no fans either. Why hadn’t anyone come to see Duran and Spandau turn up at the airport together? Had we suddenly gone out of fashion since leaving the country? And then it dawned on us — because they were all at Sarm Studios, waiting for the entire charts to turn up. As we approached the waiting crowds outside Sarm, it occurred to me that the black Daimler Princess we were riding in did not strike quite the right tone of humility for such an event as the recording of a song highlighting the starvation of a nation. We pulled up and one of our minders opened the car door. Suddenly, as I climbed out, my embarrassment was multiplied. 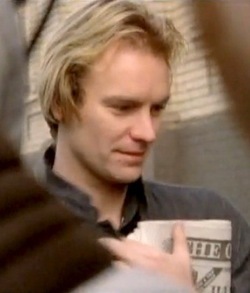 There, coming up the road with a rolled copy of The Observer placed ornamentally under his arm, looking for all the world as though he was casually walking to work, was Sting. 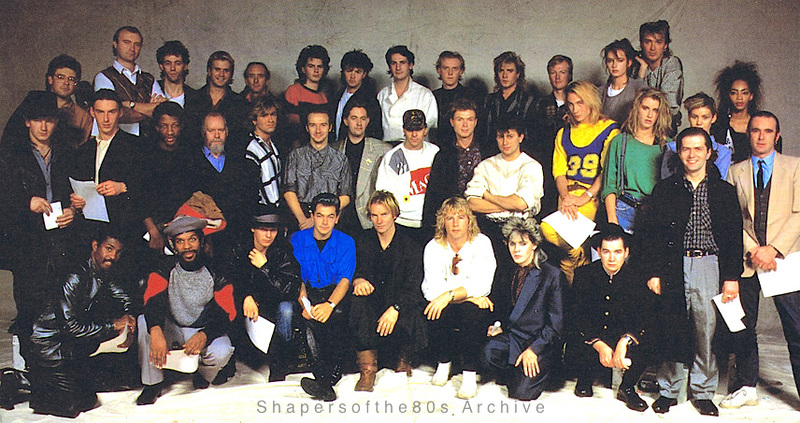 ❏ Above: The Band Aid Story is a 1984 TV documentary interviewing the participants about the making of the charity Christmas single.